These mega-projects expropriate land, spoil environments, and pollute democracies. Berta Cáceres gave her life resisting them. Early in the morning of March 3, Berta Cáceres was assassinated as she slept. A world-renowned environmental activist, Berta had been a driving force in protecting the lands and waters of rural communities in Honduras. Among the many victories of the organization she founded was the delay of a megadam project on the Gualcarque River that could be disastrous for the indigenous Lenca people living there. Berta is not alone, nor is her story unique to Honduras. Across the Global South, mega hydroelectric projects are expanding — driven by governments and multinationals as a source of cheap energy, and branded by international institutions as a solution to poverty and the climate crisis. But despite claims that they create clean energy, dams often have devastating impacts. They can displace communities, destroy the local social fabric and spiritual ties to land, lead to privatization of land and water, and generate food insecurity. Often used to power mining and fossil fuel extraction, they’re part of a system that damages the ecosystem and advances climate change. Increasingly, communities throughout Latin America have been resisting these projects. Some have succeeded in protecting their territories in the face of violent repression. Yet when these groups go so far as to speak out about the root causes of the projects — corporate greed, unfettered capitalism, political impunity — they, like Berta, may be targeted and killed. International development banks and transnational corporations are pushing an expansion of mega­hydroelectric dams at a rate never seen before. In Honduras, the Agua Zarca dam that Berta fought against is far from the only project: The Lenca people alone are facing the prospect of 17 dams being imposed within their territories. This picture is being replicated across the region. In Colombia, President Juan Manuel Santos’ master plan for the strategic use of the Magdalena River calls for adding 11 to ­15 megadams to those already in operation. In Peru, former President Alan Garcia made the construction of 20 megadams along the Marañon River into a national priority with the signing of a single decree in 2011. Overall, 829 hydroelectric projects were approved in South America during 2014, with a total investment of $22 billion. The power and resource grab going on throughout Latin America has roots stretching back to Spanish colonization. The river Gualcarque — with its deep spiritual significance for the Lenca people — was famously defended against Spanish invaders by indigenous resistance leader and hero, El Lempira. Although the form has evolved, the struggle against powerful foreign forces in the region has continued to this day. Conquering not with swords and horses but with a ruse of “corporate social responsibility” and market-based mechanisms, the plunderers of the 21st century are bolstered by a deepening and globalized neoliberal agenda. The package of privatizations, deregulations, and loosening of restrictions on trade and finance prescribed under the “Washington Consensus” for global trade — widely implemented by institutions like the International Monetary Fund (IMF) and the World Bank in the 1990s — tipped the balance of power towards the interests of corporate global elites. In Honduras, market-oriented principles reached a new extreme following the U.S.-backedmilitary coup in 2009. The new de facto government immediately overhauled Honduras’ legal frameworks in a bid to create favorable conditions for foreign investment. In practice, the sweeping changes — ranging from enforcing eminent domain to repealing laws preventing the construction of dams in protected areas — were intended to facilitate the rapid and cheap transfer of the country’s natural wealth into global markets. The explosion in the number of megadams under construction in Latin America follows a decade-long hiatus in the World Bank’s hydroelectric strategy — a pause that was prompted by social protests. After being rebranded as a “clean energy” solution to the climate crisis, however — a position amplified by industry representatives at the Paris climate talks last December — the megadam staged its comeback. Taking advantage of the new business opportunities created to respond to the climate crisis, corporations are now being effectively bankrolled by UN-sponsored market solutions such as the Clean Development Mechanism (CDM). But mega hydroelectric projects are anything but clean. In tropical regions like Honduras, they are a major source of the potent greenhouse gas methane. Moreover, mega hydroelectric facilitates the extraction of fossil fuels, such as coal and fracked gas, as well as other minerals. In Peru, as in Colombia and Brazil, mega hydroelectric dams are being brought online with the express intention of generating cheap energy for extractive industries. This unprecedented expansion of mega hydroelectric power is increasingly generating resistance. Berta’s fight against dams is being repeated in community after community in Latin America. To defend the territorial rights of indigenous and campesino people against logging and other extractive projects, Berta cofounded the National Council of Popular and Indigenous Organizations of Honduras, or COPINH. 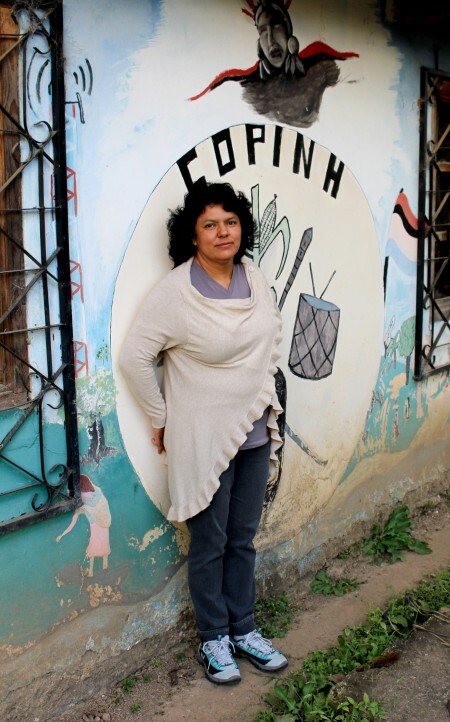 For over 20 years, COPINH has been a major player in resisting Agua Zarca, and in 2015 Berta was awarded the Goldman Environmental Prize for her role in that effort. COPINH and local communities have pursued formal routes of resistance against the dam. Yet their calls for prior, free, and informed consent as required by international law have not been heard. Cases brought to the Honduran courts denouncing the illegality of the dam were also not pursued. The imbalance of power between the industry and local communities is evident: While Agua Zarca’s backers benefit from police protection, the communities’ legal cases against the dam lapse. In these situations — a story repeated throughout Latin America — affected communities are left with little choice but to take direct action. In 2013, defying a military lockdown of the area, the Rio Blanco community took a stand. They maintained a road blockade that prevented machinery from reaching the dam site for over a year. In clashes with police and paramilitary guards hired by the corporation, Tómas Garcia was shot several times at close range by a soldier. Garcia died instantly, and his son was left injured. The activist’s assassination brought the number of deaths suffered by defenders against the Agua Zarca project to three. In a video made for the Goldman Prize ceremony, Berta explained how Garcia’s death prompted increased local resistance during that conflict. The resistance prompted Chinese Sinohydro, the largest dam builder in the world, to pull out of the project. That accomplishment “cost us in blood,” Berta said. The World Bank’s International Finance Corporation also pulled its investment from Agua Zarca. With Latin America being the most dangerous region in the world for environmental defenders, Honduras tops the list. Publicly calling out the dirty politics, human rights abuses, impunity, and systemic drivers behind the dam made her even more of a threat to the powerful actors involved. Her supporters have no doubt that’s what led to her death. The repression in Honduras is the kind of backlash to resistance all local communities face as extractivism and mega hydro expands across Latin America. Some examples will show the scope of these killings. Before the 2014 climate talks in Lima, Peru, four indigenous environmental defenders in the Amazon were murdered for protecting their territory from illegal logging. “Edwin Chota had received numerous death threats for his resistance to the criminal gangs who were gutting his community’s forests,” reports Global Witness, “but his appeals to the authorities were ignored.” The loggers are reputed to have connections to the government. Similarly, indigenous tribes living in the area of the Belo Monte megadam in Brazil have been resisting the dam for decades. They’ve suffered threats of imprisonment, police violence and militarization of the area, killings of defenders, and sexual abuse. There have been a number of legal cases made against the dam that have gone nowhere. And the megadam El Quimbo in Colombia has provoked strong resistance from local communities — who in response have faced assaults and arrests at protests, and violent evictionsfrom their homes. Accompanied by militarization, privatization of land and water, violence, and power imbalances in the judicial system, megadams are a symptom of a new form of colonization. The resistors who have died throughout Latin America have been doing the same thing Berta did: challenging the powerful. Opposition to dams isn’t only taking place in dispersed communities. It’s also spurred a global movement. The effort officially began 19 years ago. On March 14, 1997, representatives of affected peoples from 20 countries assembled in Curitiba, Brazil to take part in the first International Meeting of People Affected by Dams. Recognizing a common struggle — one that transcended different economic and political contexts — activists decided that the Brazilian Day of Struggles Against Dams would be globalized. And so was born the International Day of Action for Rivers and Against Dams, held annually on March 14. This new international platform aimed to make visible and to connect the diverse struggles taking place across the globe to protect rivers and the communities that depend upon them. But for those losing their homes and sovereignty to megadam expansion, these battles are fought not once a year, but on a daily basis. The need for international action against megadams has been underscored by Berta Cáceres’ murder. Following her example, there’s an urgent need for global activists to continuously and vociferously denounce the mega hydroelectric dam complex — calling it out as a false solution to the climate crisis that it’s helping to drive. Berta not only put her body on the line to protect the rivers, lands, and communities she felt a part of. She also went beyond her own community struggle, relentlessly shining a light on the global dynamics of power that lay behind local injustices. Like transnational corporations, resistance movements are strongest when they connect beyond fenceline struggles. Berta’s strength of resistance and international perspective posed a threat to a development paradigm based on the enrichment of global elites — so much so that the forces pushing that agenda felt it necessary to take her life. The Deadly Impact of Mega Hydroelectric Projects in Latin America. From Global Witness How Many More?